Remember that time when Neil Gorsuch’s mother tried to dismantle the EPA? 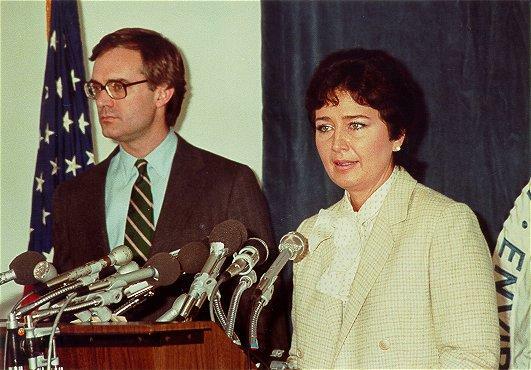 Anne Gorsuch — whose son has just been nominated by President Trump for the Supreme Court — was administrator of the EPA from 1981 to 1983, under Ronald Reagan. And much like Scott Pruitt, Trump’s EPA nominee, she wanted to rip the agency apart. Anne Gorsuch slashed the EPA’s budget by 22 percent and aggressively rolled back clean air and clean water rules and other protections. A lawyer herself, she apparently did not like to see the legal system used to protect the environment: “In the first year of the Reagan administration, there was a 79 percent decline in the number of enforcement cases filed from regional offices to EPA headquarters, and a 69 percent decline in the number of cases filed from the EPA to the Department of Justice,” a House staffer told Grist in 2004. Anne Gorsuch resigned less than two years into the job over a scandal involving mismanagement of the Superfund program. Like mother, like son? During his decade as a federal appeals court judge, Neil Gorsuch has not ruled on notable environmental cases, so he doesn’t have much of a track record to assess. He is a staunch conservative like his mom, though, and that’s enough to have environmentalists very worried. A massive climate march is coming soon to Washington. The Dakota Access Pipeline is creeping one step closer to completion.